Heat the olive oil in a frying pan. Add the mustard seeds and as soon as they start to pop, add the chilli flakes, garlic and brown mushrooms. Stir-fry for about 3 minutes. Add the porcini mushrooms, button mushrooms and wholegrain mustard and stir-fry over medium heat for about 5 minutes or until the mushrooms are tender and most of the moisture has evaporated. Add the sherry, followed by the oyster mushrooms, and stir-fry until the mushrooms start to soften. Season to taste and sprinkle with fresh herbs. Serve immediately. Stir the sour cream, dill, salt and pepper into the pan-fried mushrooms. Brush the phyllo pastry sheets with melted butter and place the four sheets on top of one another. 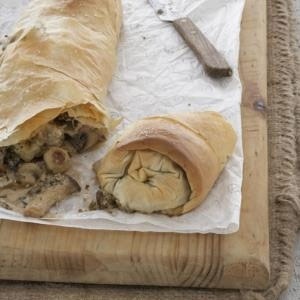 Spoon the mushroom mixture down one long side of the phyllo pastry, fold the short sides over the filling and roll up the pastry as you would a swiss roll. Brush the roll with melted butter and place it on a baking sheet with the seam side down. Bake for about 35 – 40 minutes or until golden brown and crisp. Allow to cool slightly, then cut into diagonal slices.